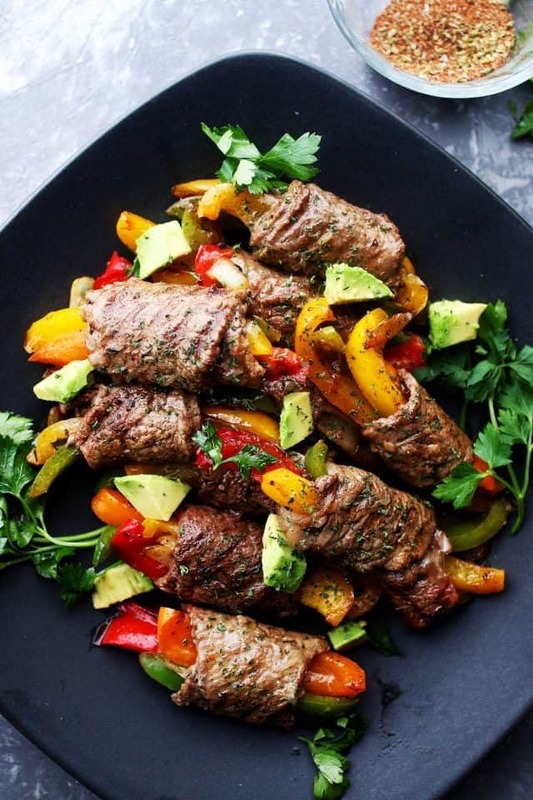 Ditch the flour tortillas & make this amazing low-carb version of your favorite steak fajitas! An easy & delicious sirloin steak recipe with a homemade fajitas seasoning mix! 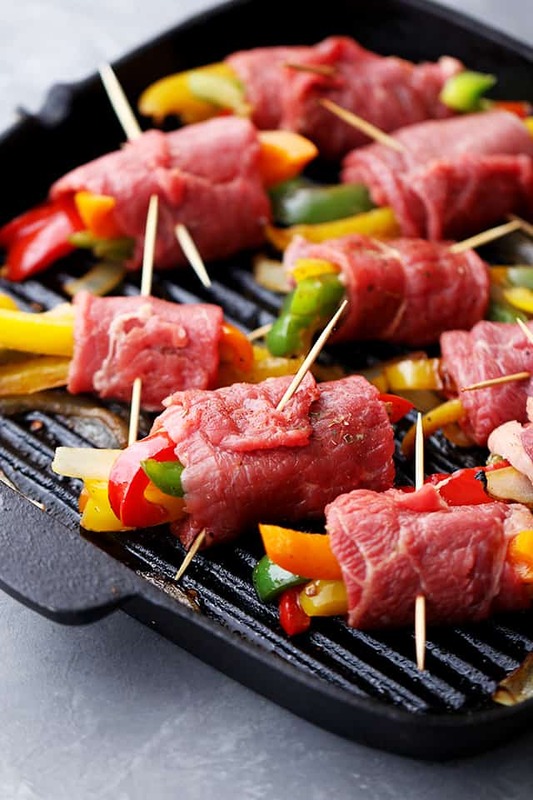 Thin slices of sirloin tip steak packed with delicious bell pepper strips and onions, all rolled up and cooked to a tender perfection! 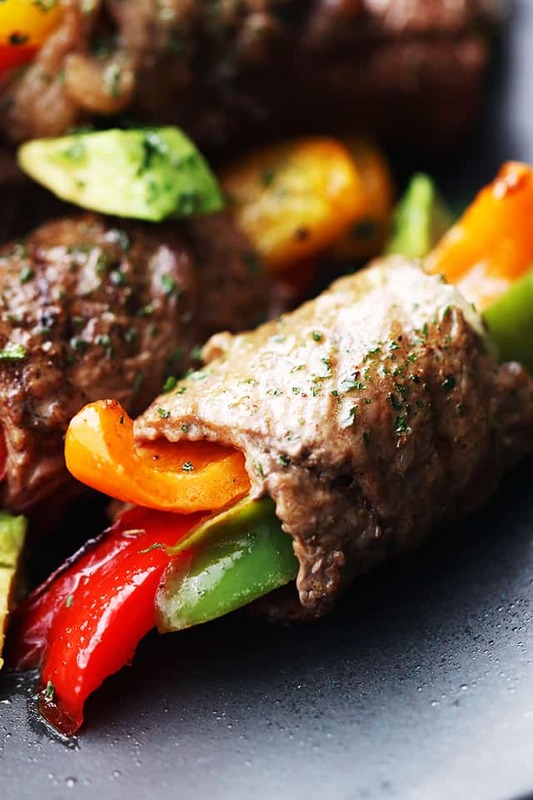 Fresh and extra flavorful, a single taste of these Steak Fajita Rollups will make you forget about the missing flour tortillas! Isn’t this the perfect Superbowl food, too? I think so. Put it on your food-to-do list. Hey ya! Happy Fridaaaay! I am gearing up for a festive weekend. Unlike the rest of you, we’re just getting started with Christmas as today we celebrate Christmas Eve! Some Christian Orthodox Churches still follow the old Julian Calendar, and for that reason we are always two weeks behind (if you will) with the Holidays. If this is something you have never heard of, I am happy to have contributed to that good ol’ saying, “we learn something NEW every day”. 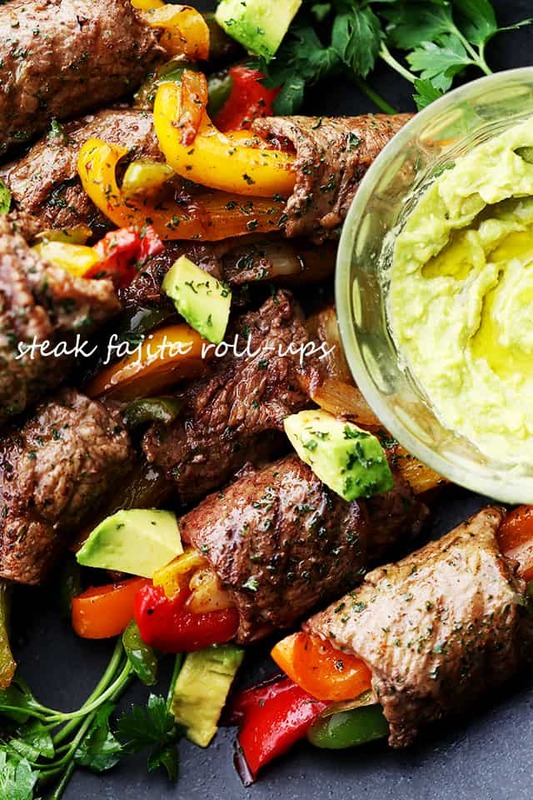 And on that note, please say HELLO to my favorite little appetizer, or sometimes a full on dinner, Steak Fajita Roll-Ups. This might even trump those perfect bites of Loaded Baked Potato Rounds. EEP! So, like, a very very long time ago – seriously, like 20 years ago – I was on this low-carb kick for months and months. 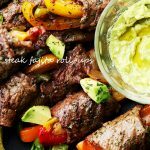 I avoided bread and starches at all costs and created all my faves low-carb-style, which is how THESE steak fajita roll-ups came to be. And trust me, if there was ever a time to get into steak, this is it! I ate every kind of meat and chicken and fish under the sun, day in and day out, thus I had to come up with fun, enjoyable ways to prepare my food, including placing vegetables inside my steak and rollin’ it up. Before we get into the step by steps, I will need you to hop on over to my recipe for Homemade Fajita Seasoning and print it out, m’kay? Takes all of a minute to make it, assuming you have chili powder, cumin, paprika, oregano, salt, etc., on hand? Once you’ve got that whole seasoning mix prepared, bust out the thinly sliced Sirloin Tip Steak (Carne Asada) and cut it into about 2-inches wide and 6-ish inches long strips. 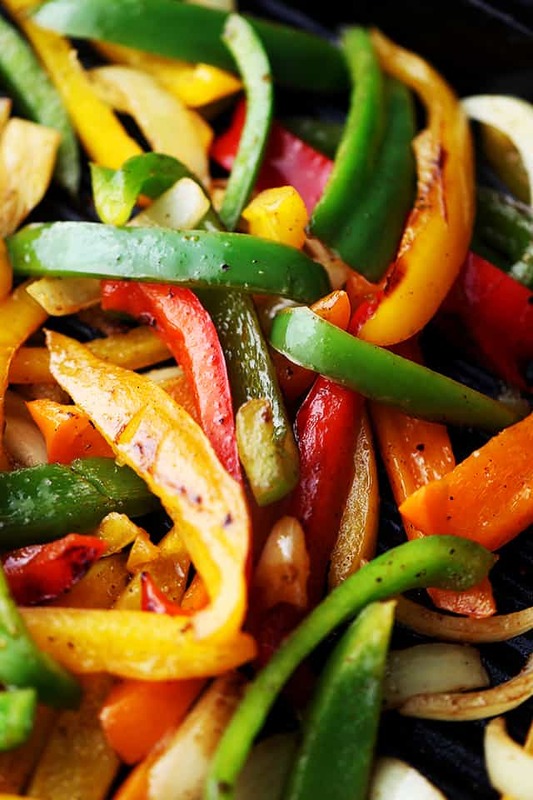 Season the strips with that fajita seasoning mix, set it aside and start slicing the bell peppers and onions. When you’re done with that, please take out your grill pan, heat it up and cook the veg for a few minutes. Once that is finished, either let the peppers cool down a bit or use tongs to transfer them to the prepared steak strips. Roll up the steak, secure it with a toothpick, put it all back in the grill pan and cook it for about 2 minutes per side, or to desired doneness. Next: plate it and serve! P.S. Double the recipe if serving it as a complete meal. If preparing as a complete meal for 4, please double the entire recipe. Use the seasoning mix according to your taste. I always end up using about 1-tablespoon of it for this entire dish. I just made this tonight and it was really wonderful! Thank you for the fabulous recipe! Looks delicious, I love this idea. I do not eat red meat. Have you ever made these with chicken? Made this for supper tonight and everyone loved it. Definitely going to be my go-to fajita spice instead of buying a bottle. Thanks so much. How do I make the dip in the video to go with it? I’d like to know for my mom please. What is the dip made of? 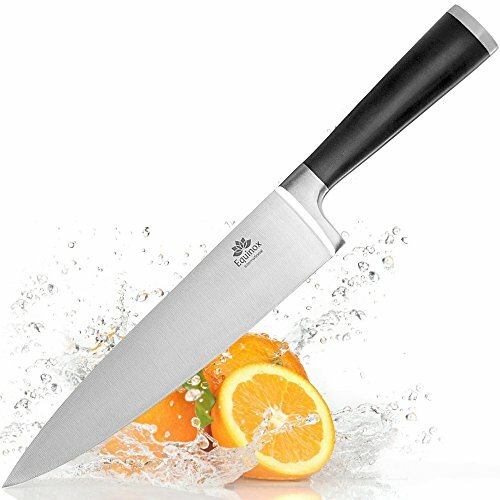 Hello I live in London, can you recommend any stake cuts for this?. I would love the recipe for what you dipped those steaks in. Very good recipe! I did have trouble finding any thin sliced beef steaks but finally came across Top Round Bracciole (?) Worked just fine so I went back to that particular store and bought more of the steak so I can make this again soon without scouring the city. I wasn’t sure how tough the meat would turn out but it wasn’t tough at all. Everyone loved it ! Thanks for the recipe! How many for the serving size? great and wonderful idea, tortillas and steak don’t really fit for me anyway, too much of a difference in texture between the two for my taste, so why or why eat those bad-ish carbs? Better to have the better carbs that you roll up here, so thank you for this! 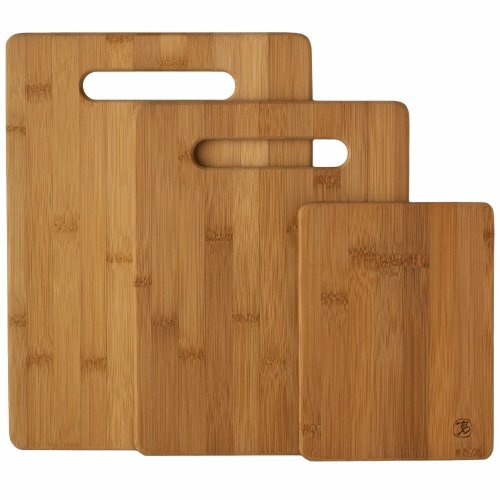 2-inch thick strips? Picture looks like 1/2″ thick strips. Am I not looking st this correctly? Video? These look like a fun dinner to make with the kids. These are genius! I love, love, love this idea! What a perfect dinner! We’ve been seriously cutting back on carbs, so this is perfect for us! These look delicious, Kate. Such a clever idea! Fajitas on a whole new level! Gorgeous photos, Kate! They look delicious! Who needs the extra carbs?? The idea of making a fajita into a rollup is GENIUS! You know when you see a recipe and you know you have to try it…that’s what these did to me! They are exactly what I want for dinner!